The older top Edo-King is amazing. Want one?? 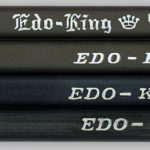 Not a lot is known about the Monarch Pencil Co, other than they were based in New York City. In the early 1950s the company was located at the Charles Broadway Rouss building at 123 Mercer St.